NEW YORK—A New York County Supreme Court justice struck down New York City’s Taxi of Tomorrow plan in a ruling issued on Oct. 8. Justice Shlomo S. Hagler ruled that the New York City Taxi and Limousine Commission (TLC) exceeded its regulatory authority, ruling it does not have the power to compel medallion owners to buy the Taxi of Tomorrow. “There is no prior precedent for the TLC to contract with a particular vendor to bind medallion owners to purchase a single, complete vehicle at pre-determined price,” writes Hagler. 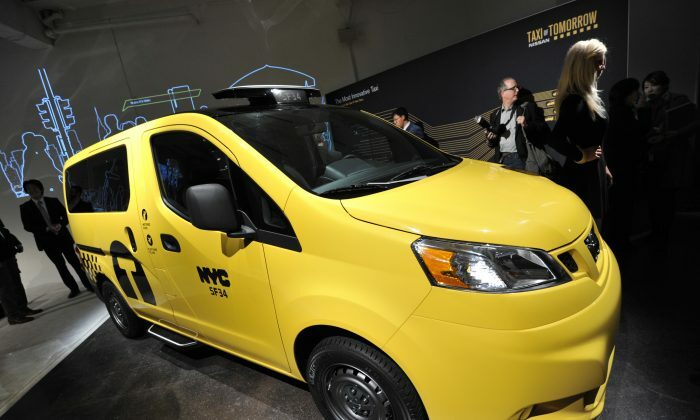 The city’s plan would replace almost the entire fleet of taxis with the Nissan NV200 over the next 10 years. “We believe the court’s decision is fundamentally wrong, and we intend to appeal immediately. It was well within the TLC’s authority to authorize the Taxi of Tomorrow,” said Counsel Michael, legal counsel to the City of New York on behalf of the city’s law department. A revamp of New York City taxis was considered a signature initiative of Mayor Michael Bloomberg. “Aside from its being by far the safest taxicab ever designed, the NV200 has superior legroom, a panoramic roof and a host of other comforts and amenities; we remain committed to bringing it to the riding public,” said TLC Commissioner David Yassky of the Nissan NV200 in statement Tuesday. The Greater New York Taxi Association and Evgeny Friedman, a taxi fleet owner, filed the complaint against the TLC and Yassky. The TLC mandated the Nissan NV200 as the city’s official taxicab, effective October 2013. Hagler ruled the TLC did not have the policy-making authority to do so. “The City Council has not delegated to the TLC the authority to contract with a third party vendor to manufacture a vehicle that would be the exclusive taxi for the city of New York,” wrote Hagler. The NV200 is neither a hybrid, nor a wheelchair accessible vehicle, although it can be retrofitted for accessibility at a cost of $14,000 per vehicle. This is the second challenge to the Taxi of Tomorrow. In May 2013, a prior iteration of the Rule of Taxi of Tomorrow was found to be unenforceable as it violated the New York City Administrative Code. In the first challenge, the court ruled that medallion owners have the option to buy a different hybrid vehicle until Nissan could offer a hybrid alternative.